Christian Devotionals | Troy C. Wagstaff aka CallahanWriter Blog: Topics of interest include Western Historical (1865-1899) Topics. Additionally inspirational Christian and Fibromyalgia interests. 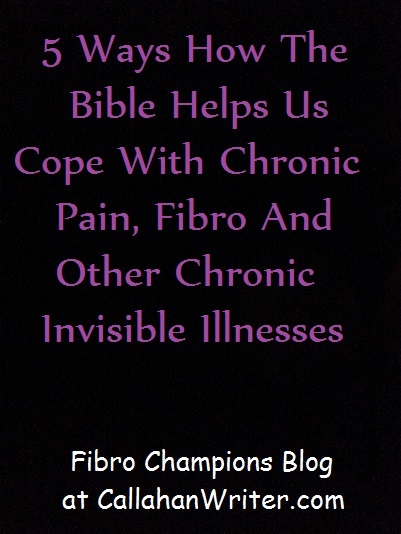 I am introducing a new thread on the Fibro Champions Blog that takes various verses from the scriptures and applies them to those of us who suffer trials and tribulations due to Anxiety, Chronic Fatigue, Chronic Pain, Depression, Fibromyalgia, Lupus, Lyme Disease, MS, POTS and any other chronic invisible illnesses. Really these little devotionals could apply to anyone who has been victimized. 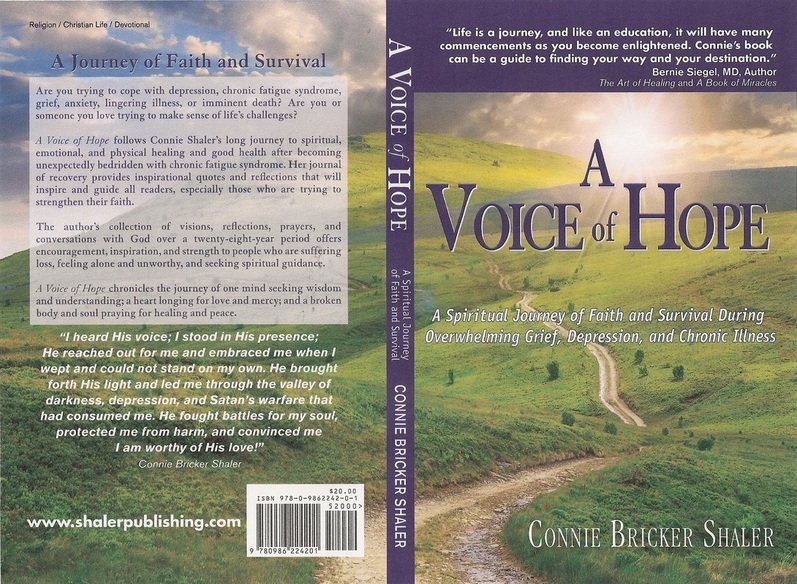 These are Biblical verses that provide teaching, hope, validation and faith in Jesus Christ. Jesus Christ is the foundation upon which all Christianity stands. His teachings can heal and help bear our burden better than any other medical solution, herbal solution or self help solution. But I advocate using the teachings of Jesus in cooperation with the proper use of the miracles of medical science. 1. Even to your old age and gray hairs I am he, I am he who will sustain you. I have made you and I will carry you; I will sustain you and I will rescue you. Isaiah 46:4 (NIV) This verse is referring to Jesus Christ. It tells us that he will sustain us, will carry us and rescue us in the various times of our needs. Who needs the Savior more than the sinner or those who suffer from health trials, especially those of a chronic illnesses? He made us and he knows us better than we know ourselves. Who better to turn to than our Creator? To sustain us means To support, hold, bear up, bear the weight, bear a burden, and to endure without giving way or yielding. To keep a person from giving way to, as under trial or affliction. 2. He is despised and rejected of men; a man of sorrows, and acquainted with grief: and we hid as it were our faces from him; he was despised, and we esteemed him not. 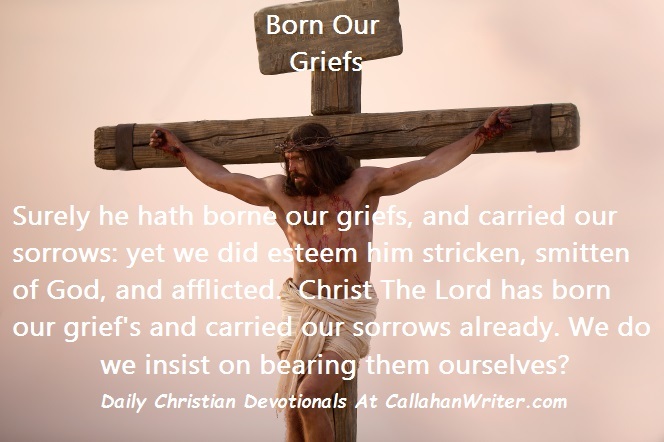 Surely he hath borne our griefs, and carried our sorrows: yet we did esteem him stricken, smitten of God, and afflicted. But he was wounded for our transgressions, he was bruised for our iniquities: the chastisement of our peace was upon him; and with his stripes we are healed. Isaiah 53:3-5 (KJV) This verse in Isaiah was a prophecy of what would happen to Jesus Christ when he came to earth to atone for our sins. He did atone for us but he did much more. He bore our griefs, carried our sorrows and through his suffering he can be healed of the consequences of our sins and we can be healed from our infirmities. 3. There hath no temptation taken you but such as is common to man: but God is faithful, who will not suffer you to be tempted above that ye are able; but will with the temptation also make a way to escape, that ye may be able to bear it. 1 Corinthians 10:13 (KJV) This popular verse means that we will not be tempted by sin or tried by tribulation more than what we are able to bear. The creator of us all, knows the limits of each and everyone of us. He knows us better than we know ourselves. The temptations or tribulations that we are called upon to bear may seem like we are being pushed beyond our personal breaking point. But we are not. 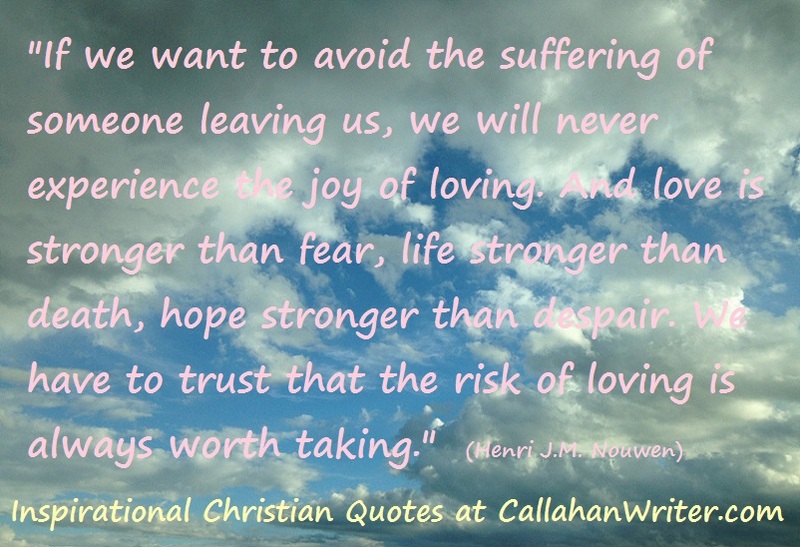 We must trust God and have faith and hold on tight. With his help, we will make it. 4. Consider it pure joy, my brothers and sisters, a whenever you face trials of many kinds, because you know that the testing of your faith produces perseverance. Let perseverance finish its work so that you may be mature and complete, not lacking anything. James 1:2-4 (NIV) To me, this passage of scripture tells me to have joy in my trials of chronic pain, fibro fog and all the other extreme symptoms of fibromyalgia, which is my chronic illness. This also says that the trials and tribulations we go through are designed four our personal growth wether it be in this life or the next. 5. If any of you lack wisdom, let him ask of God, that giveth to all men liberally, and upbraideth not; and it shall be given him. James 1:5 (KJV) This small little verse brings great joy to me in my personal afflictions. It tells me that I can approach God in prayer for anything and my prayers will be heard and answered. But as we know from other verses, the answer to prayers are based on the infinite and eternal wisdom of God. 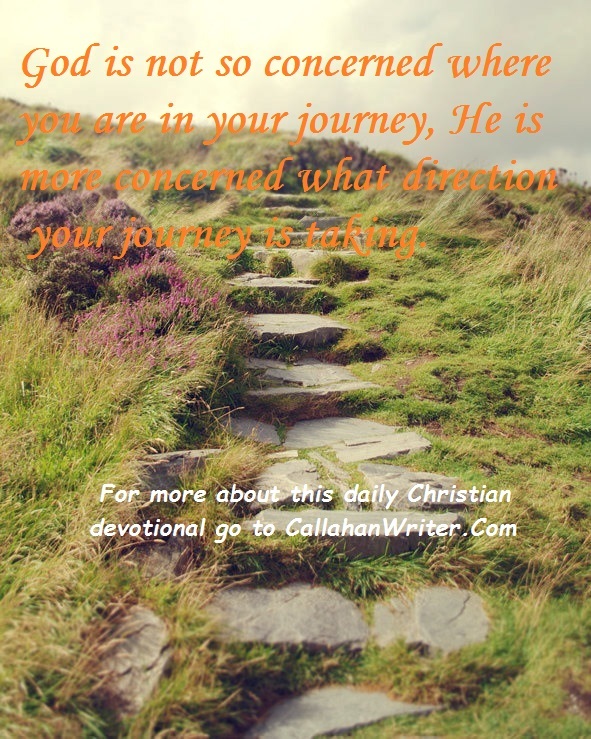 God is not so concerned where you are in your journey, He is more concerned what direct your journey is taking. Your journey starts with where you are at. The journey then is to find your way back to God. There are two possible outcomes of your journey: Heaven, living in glory with Heavenly Father or hell, living in misery with lucifer. God isn’t as concerned where you are at in this journey as he is more concerned about the direction of your journey. Are you two steps away from heaven but the direction you are taking is leading you away from heaven towards hell, or are you one step away from hell but the direction your taking is going away from hell toward heaven? That’s what matter most. 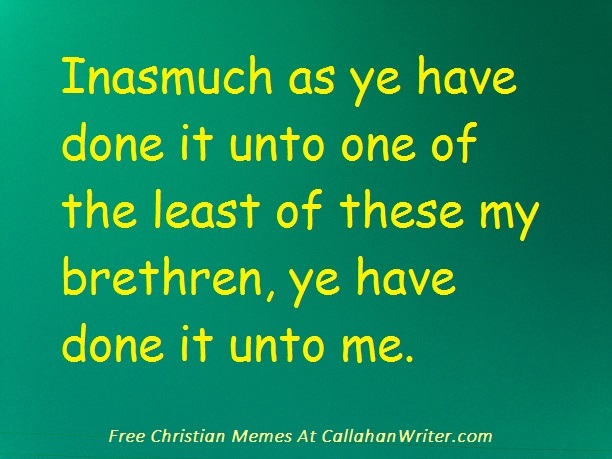 Inasmuch as ye have done it unto one of the least my brethren, ye have done it unto me. This scripture should be understood and felt by everyone that professes to follow Jesus Christ. Literally, everything we do for people is as if we are doing it unto Jesus be it good or bad. If we mistreat others we are mistreating Jesus. If we treat others well then we are literally treating our Savior well. If we turn away the beggars, or panhandlers, we are turning away the Messiah. If we open the door for others then we are holding the door open for the Master. If you bear false witness against your neighbor or treat your fellow man bad in any way you are doing the same to our Redeemer. Do these words make you uncomfortable or defensive? If so then thanks to repentance, you can be forgiven and go about treating all men good. Thus treating Jesus Christ well. You daily activities and you words you speak and thoughts you think all mean something. For better or worse, they will be used for you or against you depending on how you think and speak and treat others. God bless you all as you strive to serve the Lord through your actions towards others and your thoughts and words as well. The Old Testament taught us that Jesus Christ “hath born our grief’s and carried our sorrows: yet did we esteem him stricken, smitten of God and afflicted.” This verse teaches us far more than we will cover in this devotional. We learn that Christ, himself, while suffering in the garden and on the cross, suffered and felt our grief and sorrow. Jesus knows first hand how we feel when we are filled with sorrow, likewise he knows first hand our grief. Whom can we go to in this life that knows first hand how we feel? Many people can show empathy to us. We can show empathy to others, as we should, but we cannot know first hand their grief and we don’t know their sorrows but we can empathize with them. But I digress. Since Christ has suffered the pains and anguish of our sorrows and griefs why do we insist on going through our sorrows alone? Why do we grieve alone? Why do we settle for empathy when we can receive first hand help from our Master and our Savior? Don’t get me wrong, empathy is very nice but there is more, there is more that we can receive it we reach out to our Lord who knows perfectly what we are feeling and how we are feeling. He will help us if we reach out to him in faith with humility.